"You should sit in meditation for twenty minutes a day unless you are too busy. Then you should sit for an hour." The attribution gets a bit messy, but I have doubts that it’s a real quote anyway. I think “Zen proverb” is more likely closer to the truth. It’s one of those things that gets said and said and said, probably with a word change here and there, given as “My teacher told me,” or “Joe’s teacher told him,” or “the Buddha once said,” or any other version of the telephone game you might care to describe. It is probably that none of them are true, even while they are all true. That’s a koan in the same vein, but we’ll return to that in a bit. The aphorism above is often given as a genuine piece of advice. It may be one of the most common suggestions I’ve personally seen in meditation groups and articles and, while it’s a lovely ideal, it can also seem rather daunting. We tend to be on the go all the time, and twenty minutes can be difficult to find once, let alone on a regular basis. For people who have such trouble, the thought of giving up an hour is terrifying. Anything could happen in an hour, and by “anything,” I mean every wrong thing the Anxiety Beast can imagine. It has an amazing imagination, in case you were wondering. Good news! You don’t have to sit in meditation for twenty minutes - or an hour! - to achieve the positive benefits of meditation. 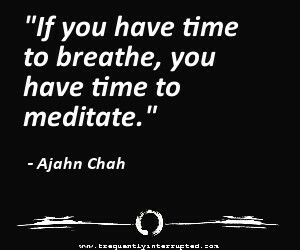 Ajahn Chah, founder of two major monasteries in the Thai Forest Tradition, so it’s likely he had some good ideas on the subject, said, "If you have time to breathe, you have time to meditate." While it may not seem like it some days, everyone has time to breathe. If you don’t have time to breathe … Well then, you’re probably not doing much of anything else, are you? "If you have time to breathe, you have time to meditate." Everyone has time to breathe, so everyone can benefit from meditation. Breathe in. Breathe out. Observe the air coming in. Observe the air going out. Be intentionally aware of your breathing. You have just meditated. Congratulations. It’s that easy. When you are drinking a cup of tea (or coffee, or water, or soda, or even beer - it honestly doesn’t matter), savor the taste, the feel, the temperature, the consistency. Don’t just notice in passing, but be fully present in the action of drinking, even if for just a single swallow. That, too, is meditation. Watch a baby learning to stand, knowing that he was unable to even roll over in the past and may be running a marathon in the future, and all of this is embodied in this one moment. Hug someone you love, and take a moment to reflect on the fact that you are loved in turn. Count your steps as you walk down the hall. Feel the movement of muscle. Hear the tap of sole to floor. Stand in the rain and notice the drops as unique, individual moments. Do you begin to see the idea? Live your life. Be present in whatever it is that you are doing, and you are meditating. In his book The Miracle of Mindfulness: An Introduction to the Practice of Meditation, Thich Nhat Hanh wrote, "Meditation is not evasion; it is a serene encounter with reality." That is the point, and that is exactly what makes meditation so helpful. We are often so busy being on the go that we forget to stop long enough to actually be somewhere. We are just passing through, everywhere, all of the time, and because of this, we are passing by the experience of living. While we pass through our day-to-day existence, life is passing us by. The purpose and usefulness of meditation is in the reminder to stop and be present. Be where you are, even if only for a minute, a drink, a single breath. Meditation can help you reduce stress, get better sleep, improve your health, and be more positive and alive overall. Most of all, though, it helps you remember to be you. It helps you to stay grounded so that you don’t get washed away in that rushing flood of activity you think of as living. Taking the time to experience everything as it is makes it easier to keep straight what everything is. It helps you to not get so caught up in all of the pieces that make up your life that you forget to live your life. As with most things in life, the more you put in the more you’ll get out. If you take the time to meditate for, for example, twenty minutes a day, you will find it more beneficial than snatching stolen moments from time to time. If you are consistent about it, you will get even more benefit, following the normal Practice Makes Perfect rule. If you establish a consistent practice and make use of those additional moments when you can, the benefits just keep adding up. The more effort you make, the more benefit you receive, but any effort receives some benefit. "You should sit in meditation for twenty minutes a day unless you are too busy. Then you should sit for an hour." I told you we would come back to this. It’s good advice. It really is. It’s just also usually misinterpreted. This is a Zen proverb, or koan, and the thing about koans is that they are not literal statements. They are thought puzzles. They are mental stimulants. They are often tools that are used in meditation to assist the practitioner think in a different direction than the usual. Twenty minutes a day of meditation is a fantastic practice, and is recommended by teachers all around the globe. Very few of those same teachers would suggest that a person stressed out from being too busy spend an hour a day in meditation. The frustration, alone, would probably interfere with any positive that might be expected. It’s not realistic, and almost certainly not beneficial. What they might suggest, however, in their own enigmatic fashion - say, perhaps, through the utterance of a koan - is that the person who is so busy take a moment to examine why. Are your priorities in order, and are they where you need them to be? Are you doing what you need to do to be a better you? Living a mindful live means being able to answer these questions. There are 1,440 minutes in the day. Think about it. You’re not a placeholder in the universe. You’re a complete person with a life meant to be lived. Take the time to breathe. There are going to be times when life gets away from you - it happens to us all - but it’s your life. Remember that more often than you forget, and take the time to live.